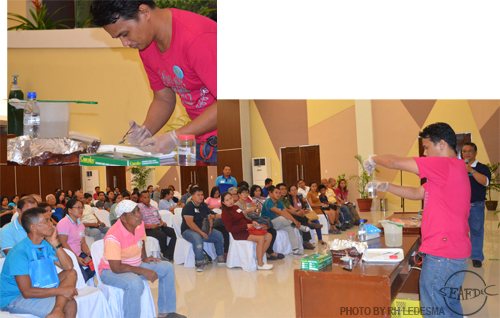 More than 100 fish farmers and other stakeholders from the academe and local government units participated in the Farmers Forum held at the SEAFDEC/AQD Multi-Purpose Hall in Tigbauan, Iloilo, Philippines on July 6, 2017. The topics discussed were fishpond culture and management, growing single oysters, nursery of mangrove and blue swimming crabs, and biosecurity in hatcheries and in grow-out culture. The lectures were delivered by Everglory Agri Aqua Farm technical manager Mr. Eliseo Coniza, SEAFDEC/AQD experts Ms. Jocelyn Ladja, Dr. Fe Dolores Estepa and Dr. Leobert dela Peña, respectively. Aside from the lectures, a demonstration on the collection, preparation, and transport of samples for disease diagnosis was also conducted by SEAFDEC/AQD senior technical assistant Mr. Demy Catedral. The participants also had a chance to seek advice from SEAFDEC/AQD experts during the open forum and exchange ideas with co-participants. 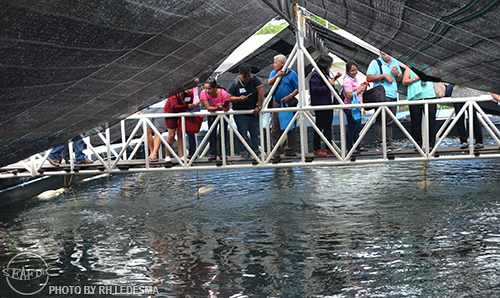 The event capped off with a tour of SEAFDEC/AQD facilities in Tigbauan. The Farmers Forum was organized as part of SEAFDEC/AQD’s 44th anniversary celebration in pursuit of its mandate to disseminate and promote the exchange of information on aquaculture.